Apparently it is Citrus Curd Week on the Interwebs – and no one told me! I’ve been thinking for a couple of weeks now about what I was going to make for Tigress’ January Can Jam; citrus is a lovely and broad category and there are so many choices! There are a couple of marmalades that I make each winter that Tai loves; one a pink grapefruit version with bourbon vanilla bean, the other a spicy orange marmalade with Arbol chiles. However, I wanted something different. I have been meaning to search out a home-canning suitable recipe for fruit curd for a while and this seemed the perfect opportunity to share a great recipe for the Can Jam and make myself some delicious citrus curd. Apparently I wasn’t the only one with the curd idea this week. Marisa at Food in Jars and Laura over at (not so) Urban Hennery both made Meyer lemon curd this week. But, ha! I made lime curd. Totally different. I used a recipe designed for home canning, developed by the National Center for Home Food Preservation. 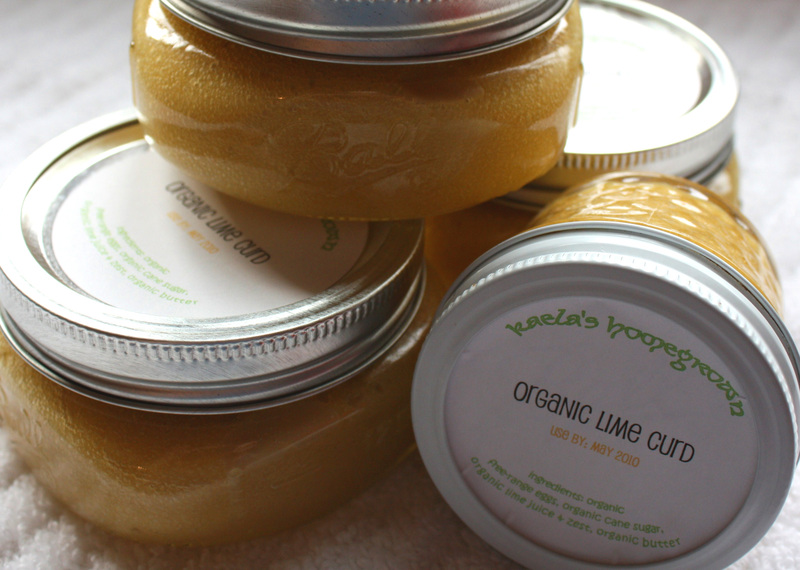 Because of all the eggs and butter, home-canned lime or lemon curd is not as stable as jam or pickles, and can only be stored at room temperature for a few months. Because of this limited shelf-storage, I was pretty careful to stick to the recipe – using bottled lime juice for “consistency in acidity” and not reducing the sugar (as I normally would) because sugar acts as a preservative. I wanted to make Key lime curd, but alas, no organic Key limes to be found in my hood (since you use so much of the peel, for marmalades or curds I always use organic fruit) nor could I find Key lime juice. 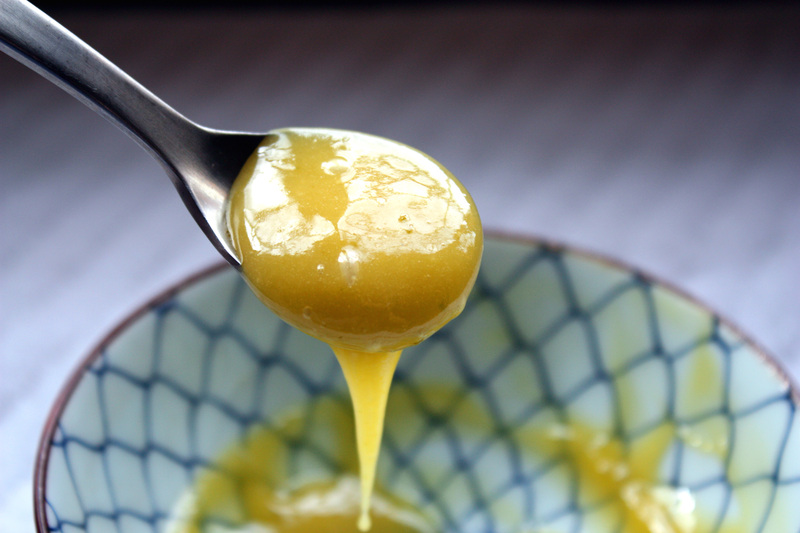 The flavor of this lime curd is quite lovely; as Tai puts it, it is not “smack you in the face” tangy like a traditional lemon curd, but a bit more subtle. He has been thoroughly enjoying it over chocolate ice cream for the last two days, while of course it would be wonderful as the base of a lime meringue pie, or I think, as the surprise filling to chocolate cupcakes. Frankly, I think both the bright yellow color and the smooth, silky texture suffer a bit on canning (the picture above is pre-canning); it’s still quite delicious, but I will probably reserve canning curd for those times when I need to ship a gift and otherwise freeze or make curd fresh. There you have it – my first Can Jam recipe and I tell you not to can it. Now that is different! For hundreds of fabulous citrus-canning ideas, check out the January Can Jam round up over at Tigress in a Jam. Prepare canner, jars and lids. Do not heat canner water to boiling; hold at 180 degrees F.
Combine superfine sugar and lime zest from 4 limes in a small bowl; whisk well to mix, and allow to sit for 30 minutes (reserve lime flesh for another recipe, like Blackberry Lime Jam). Heat water in the bottom of a double boiler until it boils gently (do not allow water to touch the top double boiler pan). In the top double boiler pan, off heat, whisk together eggs and egg yolks; add sugar/zest mixture and blend until smooth. 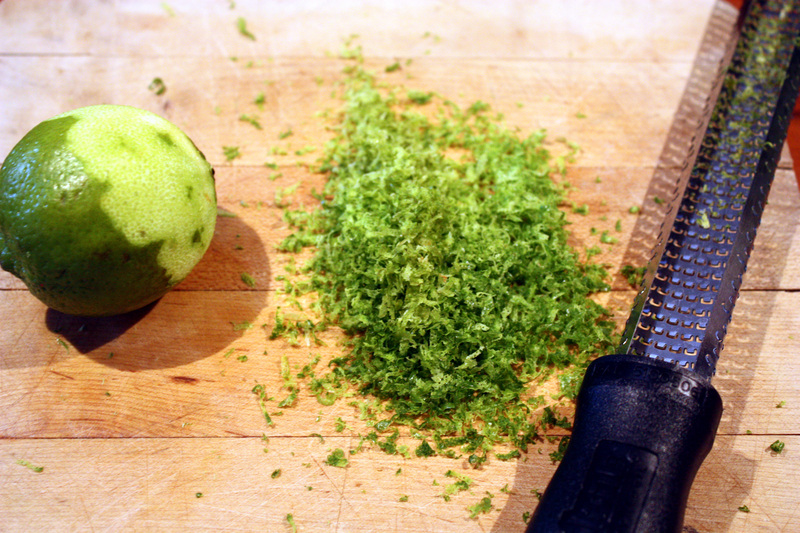 Blend in lime juice. Place the top of the double boiler pan on the stove over the bottom pan. Add in butter pieces. Stir gently but constantly until mixture reaches a temperature of 170 degrees F (about 10 minutes). Remove from stove and continue to stir until the curd thickens (about 5 minutes). Strain though the fine mesh strainer into a heat-proof bowl. Add remaining zest and fold to incorporate. Fill hot curd into clean, hot 8-oz or 4-oz jars, leaving 1/2-inch headspace. Remove air bubbles, wipe rims, afix lids and place in 180-degree water bath canner. Heat water bath slowly until it reaches boiling (about 25 to 30 minutes according to original recipe), then start the timer for processing; process lime curd for 15 minutes. Yields about 6 half-pint jars. The processing time developed for this recipe includes heating the curd in a water bath that starts at 180 degrees F, reaches boiling, and then continues to boil for 15 minutes. The NCFHP states that heating from 180 degrees to boiling should take about 25 to 30 minutes; it took less than 10 minutes on my stove. I turned the heat off, let the boil subside, and then put the heat on very low for an extra 15 minutes, for a total of 25 mintues of pre-boiling processing, then raised the heat to boiling again and processed for 15 minutes. It’s a cumbersome way of processing, but I wanted to give my curd the best chance for remaining stable as long as possible. Since this curd is shelf-stable for only 3 to 4 months; make sure you label it with the date, or, if giving as a gift, consider a “use by” date on the label. The original recipe for lemon curd called for 1 cup bottled lemon juice and 1/2 cup zest. The original also does not include any zest in the final product; I wanted some fresh zest flavor in the final curd, but was not sure how adding all of the zest would affect shelf-stability, so I added 1/3rd of the total zest amount to the strained curd. I found this curd a bit sweet; I think 2 cups of sugar would be plenty. I usually do reduce the sugar in most canning recipes, but for this one I was not sure how it would affect storage life, so, I left it at the original amount. This curd recipe can also be frozen; simply allow to cool at room temperature (place plastic wrap directly on top of the curd to prevent formation of a skin) then freeze in individual containers. For other curd recipes, not tested under canning conditions, see Pink Grapefruit Curd (and friends). Canned, at cool room temperature, protected from light, for 3 to 4 months. Product may separate and/or start to brown upon longer storage; if this occurs, discard. Frozen up to 1 year. Refrigerated up to 3 weeks. Citrus is in season in our winter, but is generally available year round. I agree that the texture does suffer a bit upon canning, but when the curd is removed from the jar and briskly stirred, it regains the majority of its sheen and silky smoothness. And yes, it’s delicious with chocolate ice cream. I almost want to lick the screen it looks so yummy. 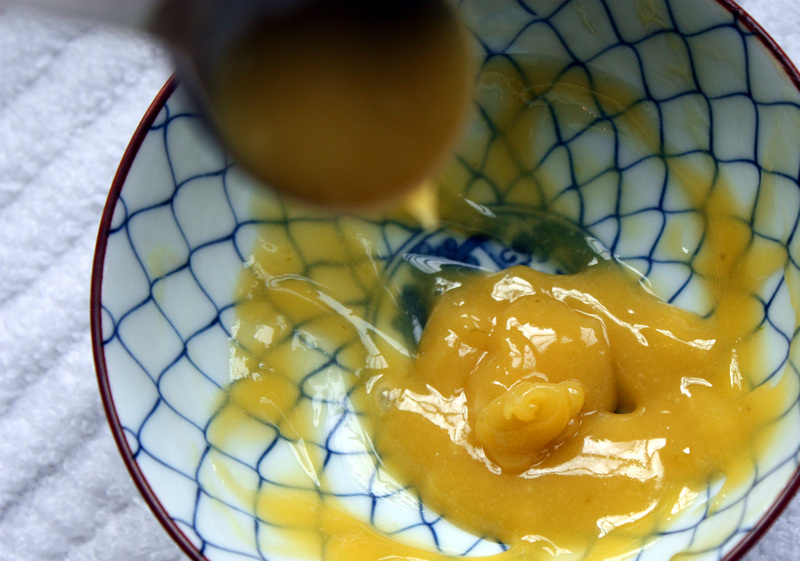 Citrus curd is one of my most favorite things. Looks beautiful! I love lime curd. And your labels are adorable. Chocolate ice cream, huh? Who woulda thunk. wow that looks great- I made curd too only orange….I may have to try this too- so many recipes so little time. This Can Jam challenge has only just started and I’m just so glad to be discovering some great blogs, like yours. Hope to visit regularly from now on. Lime curd on ice cream sounds decadent! I love stirring lemon curd into my morning yogurt (or using it to top a cheesecake). Yum. sounds awesome! thanks for posting! i love lime and have been wanting to try to make a curd, so i will definitely be referring to this recipe. it probably won’t make it to my canning blog, though, if it’s as good as everyone says it is.. thanks! I had a bag of small limes on my counter, and after a brief googling found the PDF of this recipe and your site! I canned mine in the exact same little square halfpints, looking forward to gifting it off with a scone recipe. I grew up with a lemon curd on yellow cake, and it’s always been my favorite. I recently had lemon-ginger curd on pancakes, and haven’t been able to stop thinking about it. I’ve been looking for a canning stable curd recipe since last summer, and I was so excited to find this one! I love limes, perhaps even more than lemons.